More than the game’s box score is what we call the game of Life. And, also as big as life, you will find the Giants Community Fund and the Giants Community Relations Department. It is a spirit, an energy. They see it as a proud tradition, a way of showing mutual appreciation, and teamwork, that we are truly together – team and community. This is our special team off the field that always goes to bat for our community, our businesses, our organizations, our non-profits and our youth. Who are these angels? They are Staci Slaughter, Senior Vice President of Communications, Shana Daum, Vice President of Public Affairs and Community Relations and Sue Petersen, Executive Director of the Giants Community Fund, their staffs and all those who are employed by the San Francisco Giants baseball organization. What they are doing off the field, for our community, as well as on, is a story of champions. It is all truly a reflection from the top on down, complete with heart and devotion. The Giants are enjoying a sell-out every home game in beautiful AT&T Park. Was it really just 15+ years ago, when maybe 5,000-20,000 people would brave the freezing cold and winds of Candlestick Park? Do you believe in miracles, for this was truly one … indeed, how things have miraculously changed. How well do you know, or remember, just how close we were to losing the Giants first to Toronto and then a few years later to Tampa Bay? It was extremely close to happening, but thanks to the dedicated and determined efforts of Larry Baer and Peter Magowan for creating a very real “Dream Team” of ownership partners, the San Francisco Giants were suddenly and very fortunately saved. I don’t think people realize just how catastrophic that would have been, and the ramifications it would have meant, had the Giants been taken from us. What has come to fruition since: AT&T Park, a most beautiful new ballpark (arguably the best in all of baseball), sellout games, a revitalized SOMA and San Francisco, hundreds of millions of dollars that have gone to benefit local San Francisco and Bay Area community development, non-profits causes and two World Series Championships in three years (when not one in all the years prior since their arrival from New York in 1958); and the outstanding community programs that were born from this. All this from a vision and great fortitude. From the top on down, led by President and CEO Larry Baer, the current ownership group has instilled a culture, a tradition, a legacy, if you will, within the San Francisco Giants organization that is indeed rocksolid and part of their own DNA. They believed strongly in their vision, their dedication and their hard work to build AT&T Park. 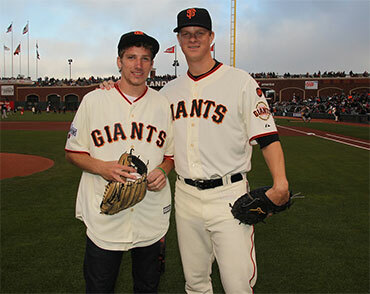 They also believed strongly in expressing the gratitude that the entire Giants organization feels for its community. They believe in their responsibility, to carry on the Giants legacy of giving back to the community and in turn the fans who support them. 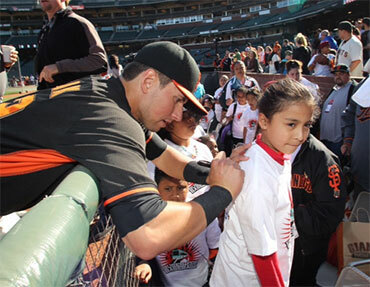 It is truly a love affair between the Giants and the community they serve – and it shows. It is so very evident. In my conversation with Staci, Shana and Sue, I was enjoying every word they had to say. It was all with such enthusiasm, heart and passion. They love so much what they are doing … and they have each been doing this now for many years. We read in the news all that’s wrong about sports … that’s why I am happy to share this with you, all the GOOD that these Giants do off the field, because we don’t hear this; no, not near enough as we should, if at all. The Giants take their off the field community programs very seriously. As much as they do well on the field, they do it off the field, as well. This is their arm where they can give back to community … and they do … and they have been doing, year in and year out, all these years, an extraordinary job. 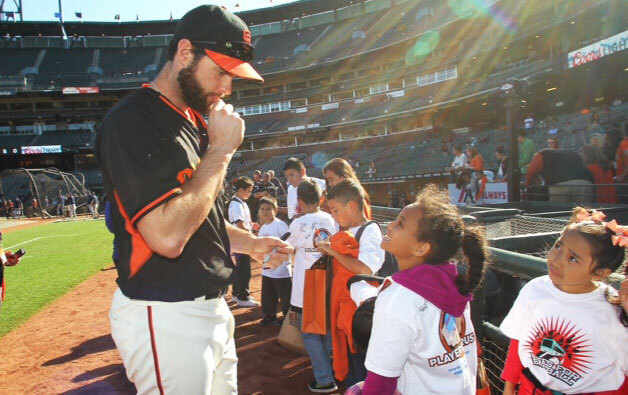 Indeed, the Giants Community Fund and its Junior Giants Program won a national award called the Steve Patterson Award for Excellence in Sports Philanthropy …becoming the first Major League Baseball team to have ever won this coveted honor. And the great Giants announcers whose voices we have become so familiar with, and love listening to, are the voice of the Giants on the field, and also for the Giants organization and how it connects with the community off the field. You will hear how they often talk about the team’s community endeavors and the results will beautifully speak for themselves. The Giants sellout all their games … and beyond the three million guests each year who joyfully are coming to the Giants games, there are hundreds of millions more, together with them in spirit, listening on the radio and watching on TV. No question, the Giants and the large community have been and are really enjoying this mutual love affair … and are seeing great direct benefits, and results, as well. Are you possibly wondering what kind of participation there is by the Giants team, players, coaches and staff off the field? It is all voluntary and it is 100% - where the entire Giants organization, from the top on down - gladly participates. They make guest appearances, where they will visit and speak to schools, hospitals and non-profits. Indeed, they touch community always in a warm and sincere way. They, too, have and share this very special feeling between the team and community. In addition to the many local causes and nonprofit organizations they help support, they also have been and are involved in helping with great humanitarian causes, such as raising literacy … and funds to help support the victims of, for example, Katrina, Sandy and the Philippines … and they were the first professional team to help raise funds and build awareness in their support of what has become an annual event: “Until There’s A Cure Day” in the fight against HIV and AIDS. Through its Junior Giants Program, the Community Fund allows more youth to play baseball where it wasn’t possible - building fields, and creating leagues – all free to participate. They find coaches and work closely with the Positive Coaching Alliance, as they help in providing excellent coaching and training. They produce a wonderful handbook each year that is so well thought out and prepared for the parents and their children to read together … and discuss important and meaningful topics like teamwork, character, good health, non-violence and bullying prevention (Strike Out Bullying). Positive role models do have an important place and do help make a big difference. 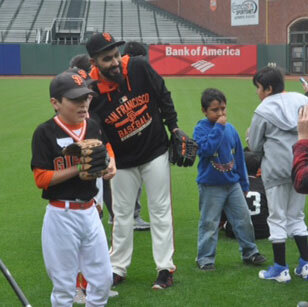 Here, with the Junior Giants, 20,000 kids a year, more than 200,000 in the 20-plus years, have so benefitted. Does it make a difference? For these kids, it surely has and still does. Let’s for a moment talk Junior Giants. What’s it about? How about the 4 Bases of Character Development … 1st Base = Confidence, 2nd Base = Integrity, 3rd Base = Leadership, Home = Teamwork. You can’t score unless you touch All The Bases! 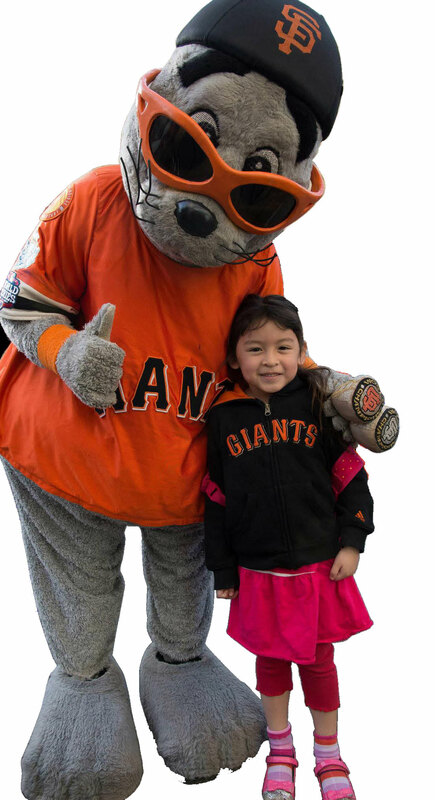 Through this amazing handbook, in addition to Character Development, there is also Education – The Giants Community Fund is proud to offer a summer reading program for all Junior Giants players. There is also Health – Be A Healthy Junior Giant: Snack smart with healthy snacks, Exercise 30 minutes of physical activity a day, Enjoy a soda-free summer and Protect yourself by using sunscreen. Then there is Violence Prevention – Where: I pledge to strike out bullying … Peace starts within you … “I will build peace on the field, at home, at school and in my community each day.” And, then, there’s the Junior Giants Willie Mac Award – This will go to one outstanding Junior Giants player and coach that represents their league, as chosen by their League Commissioner. The Junior Giants encompasses 87 leagues … 210 cities served … 21,558 Girls and Boys and 2,966 coaches. I cannot imagine what any of this would have looked like if the Giants were the Toronto Giants or the Tampa Bay Giants … and the San Francisco Giants a thing of the past and none of this - AT&T Park, two World Series Championships, the Giants Community Fund, Community Relations and Junior Giants programs, and the many millions of dollars each year to benefit community and youth programs, making a huge difference for our community day in and day out, all year long, every year - yes, none of this would exist for us today if not for “them” – this, our very special Team. These are angels and our Giants are indeed Giant … indeed Champions on and also most definitely every year off the field. 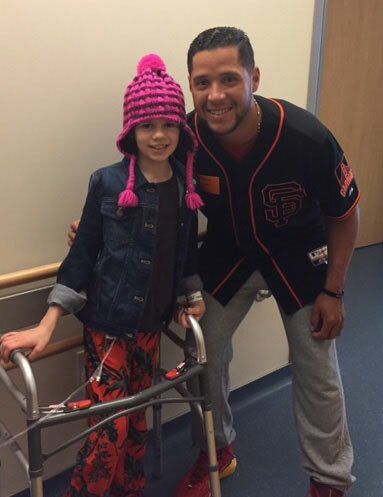 Far beyond the box score, it’s another walk off winning home run and perfect game the Giants perform in the game of life and what they do for community. Thank you for all that you have done, are doing and will do. If not for them, it would be a completely different ballgame. There would be no game. Because of them, we are Champion. From the top on down, it is all by design, dedicated to making such a big difference. It really is an entire Team effort and a mutual love affair with the community … that is indeed very special.